Breast Milk is Natural. It’s Mother Nature’s way of empowering every woman to nourish, nurture and protect her baby. Breastfeeding is all about how the mother and child bond gets fostered and more. It’s about the love, warmth, and the feeling of “coming alive” by kindling a life! No wonder breastfeeding is a natural phenomenon. After all, we belong to Nature and not the other way round! Here, we explore the importance of breastfeeding for the infant. For newborns, milk is the primary source of nutrition. It is the first stage of nutrition where their bodies accept nutrients through milk produced in the breasts of their mothers. This form of energy-intake continues till the time the infants can eat and digest. How Breastfeeding Keeps Your Baby Healthy? 2. Boosts Immune System: Breastfed babies respond better to vaccinations because the breast milk helps to mature the immune system and decreases the risk of childhood cancer. 3. Hygiene Needs: Breast milk is always available at the right temperature and is clean. 4. Breast milk changes and adjusts constantly to meet baby’s needs: Breast milk is the perfect food for your baby because the milk changes in composition and volume according to the time of day, nursing frequency, and age of baby to promote healthy growth. 5. Higher Sensory Perceptions: The breast milk helps sharpen the visuals of the baby. 6. Higher Sensory Protection: The breast milk shields babies from allergies like eczema and also makes them less prone to ear infections. 7. Stronger Joints and Muscles: Breast milk prevents and reduces the chances of juvenile rheumatoid arthritis. 8. Protects Respiratory System: Breastfed babies develop a stronger resistance to upper respiratory infections, wheezing, influenza and pneumonia as well. 9. Better Heart Condition & Improved Circulatory System: Breastfed babies grow into adults with lesser cholesterol rates and have relatively lower heart rates. 10. Preparation of accepting solid food: The subtle changes in the taste of breast milk help to prepare the baby start accepting different solid foods. 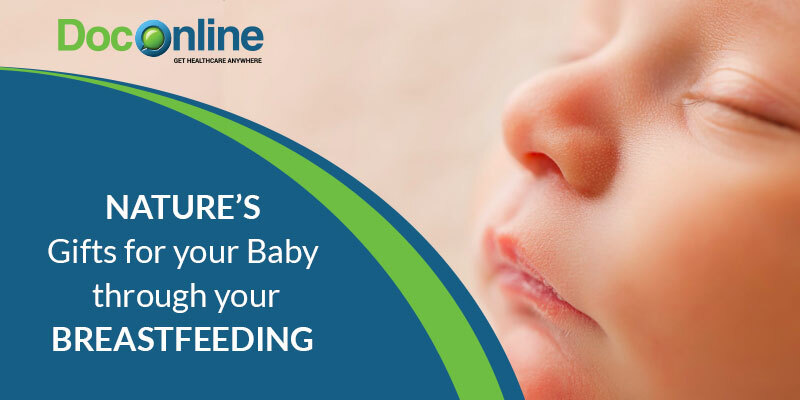 Thus, breastfeeding helps in the transition from liquid diet to solid diet. 12. Boosts Endocrine System: Breastfeeding reduces the risk of contracting Diabetes. 13. Easy Digestion: Babies can easily digest the breast milk. Hence, they are less prone to diarrhea, fewer gastrointestinal infections and food allergies. 14. Proper bowel movement: Breastfeeding prevents constipation with improved bowel movement. 15. Better Kidney Function: As breast milk has less salt and less protein, it is easier on the baby’s kidneys. 16. Urinary Tract: Breastfeeding reduces the chances of urinary tract infections. 17. Higher IQ: Breast milk contains cholesterol and other various types of fats that help in the growth of nerve tissues. More the tissues, better synaptic connections and thus breastfed babies are reported to show higher IQ. 18.Helps Babies to grow Healthy: Breastfeeding allows babies to become healthier and gain weights appropriately. With Aug 1st to 7th being observed as the World Breastfeeding Week, DocOnline launches its special Breastfeeding Awareness Edition. Each of these 7 days, we bring you new insights about breastfeeding and its importance to ensure a healthy and happy life for both mother and child. Talk to a Doctor NOW!